We wanted to share this great Infographic about Kitchen Design Trends for 2015. Of particular interest is the lighting. Lighting is one of the most important design elements especially in kitchens and is too often not paid proper attention in the overall design plan. Brought to you via HOUZZ–great article about kitchen design for today’s home owner. No matter which room of your house you’re redecorating and how clutter-free you live, you will always need a place to keep your possessions. Even the strictest minimalist requires practical objects at hand on a daily basis. Closets or cabinets are functional, but their overuse can make your rooms look smaller. If you have an empty corner or wall space that you want to utilize more effectively, glass shelves may be the solution. Let’s say you have an all-white or cream-colored bathroom with a large tub for luxurious baths. You want a clean and simple way to organize your bare necessities. Fitting a set of glass shelves in the nook next to the tub will maintain the room’s relaxed, spa-like ambiance, while keeping your toiletries, candles and towels nearby. If you’re transforming your living room or basement into a bar, you will probably use wooden cabinetry. To create a contrast to the dark wood, install a few floating glass shelves above the sink. The shelves, as well as the glasses and bottles you display, will sparkle in the light. 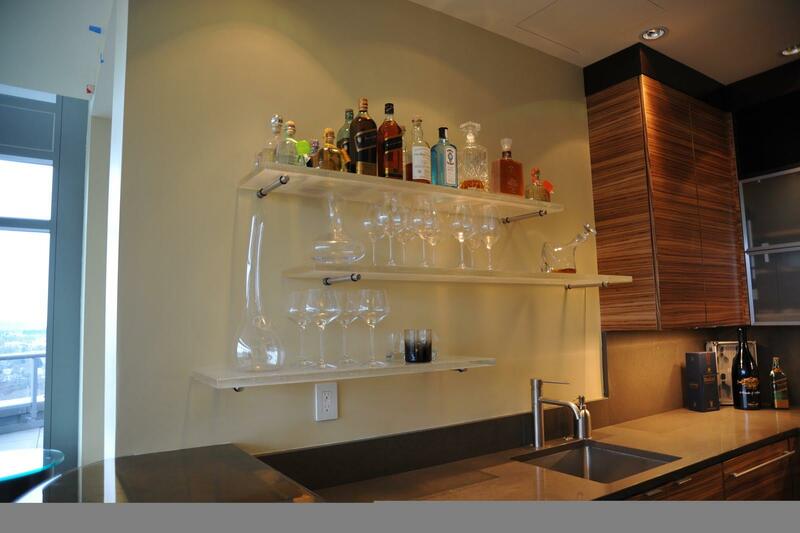 In this particular example, the thick, frosted shelves match the modern fixtures and feel of the bar. The great thing about glass is that you can customize it, choosing the hue, finish, and width of your shelves. On the topic of customization, glass shelves can also be fashioned in unexpected shapes and designs. Are you an art lover looking for a unique way to show your collection? Get your sculptures and vases out of the stuffy display case and onto multi-level, zigzagged shelves. The interesting form of the shelves will guarantee that the art is the focal point of the room, starting conversation and spurring compliments from your guests. 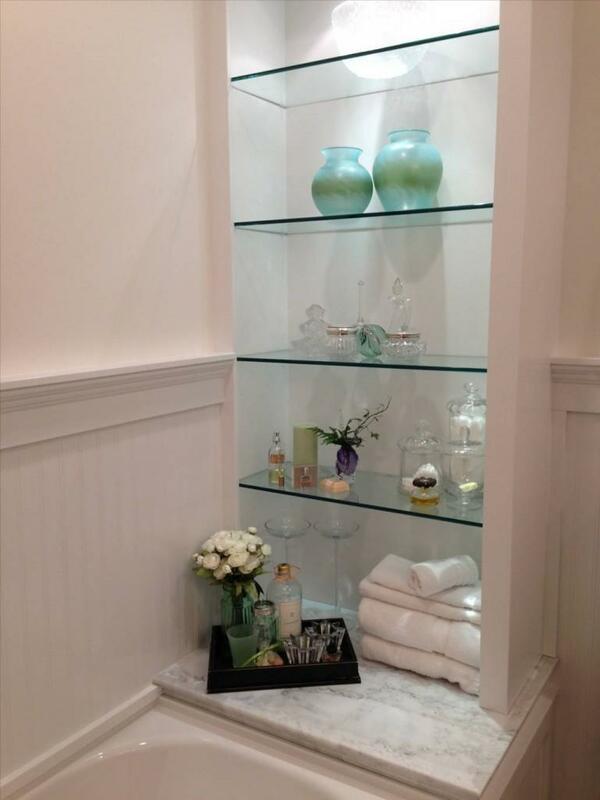 As you can see, glass shelves are a simple, beautiful way to add practical storage space to your home. There is an abundance of shelving styles on the market, but don’t limit yourself to the options found in big-box stores. Whether you want etched or smooth, curved or straight, green-tinted or crystal clear glass, have an expert create shelves that match your taste. About the Author: Glass and Mirror Pros in Orlando is a company with over 30 years of experience in the glass industry. Our dedicated technicians can repair or replace windows, sliding glass doors, and install glass shelves, shower enclosures, and more. We are passionate about interior design and making homes beautiful with glass products. Find us on Facebook for more information and creative ideas! 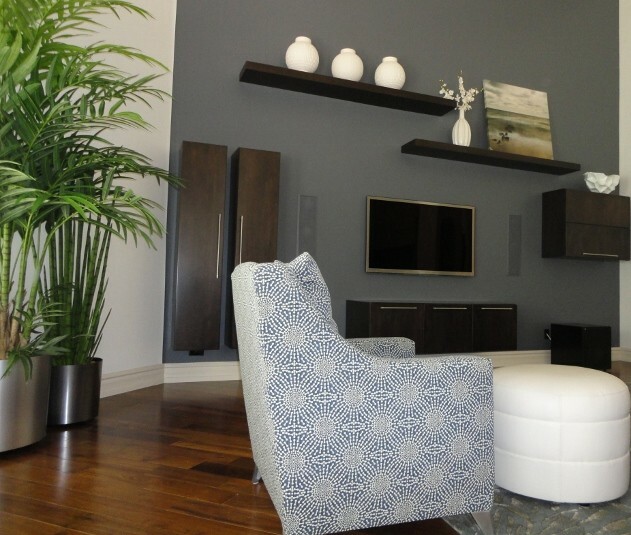 S Interior Design has been working with clients on a lot of remodel projects lately. Folks are investing in their homes, or moving into new homes that need a bit of updating. Below we share a well written article that high lights some of things to expect when you under take a remodeling project. If you’ve never remodeled before or are taking on a big project, you may feel a little nervous. How much will it cost? How long will it take? Between the large expense and the excitement of anticipating your finished remodel, it’s hard not to feel a little apprehensive. Knowing what to expect can help allay your fears and make you better prepared for what’s to come. 2. Noise. It will be incessant. Whining saws, scratching Sheetrock sanders and thumping nail guns followed by bellowing compressors: in short, little peace or quiet. Find another place to nap and don’t count on working from home unless your home office is far away from the construction zone. If you’re sure it couldn’t possibly be that bad, visit someone else’s home under construction and you’ll see. 3. Triumphant highs. For you it may be the demolition of the ugly vinyl floors in your kitchen. For others it may be the installation of the carefully selected back splash tile. Others still may feel elated only when they see Sheetrock go in or get to relax when their project is completely done. 7. Cash concerns. Even if your project is right on budget, the sheer amount of money you are spending may cause a bit of a freakout. If you’re used to writing four-digit checks, you can easily be writing checks with one or two more zeros during a large remodel. If costs are increasing, along with change orders, it could increase your anxiety. Having cash on hand that’s a bare minimum of 10 percent above contract for contingencies will help alleviate that stress. Have 20 percent if you want to worry less. 9. Decisions. Where should that outlet be? How high do you want the shower head? Where do you want the cabinet hardware mounted? Oil-rubbed bronze or chrome or brushed nickel or satin nickel? Is your head spinning yet? Count on hundreds of questions that you’ll need to answer as your project proceeds, or select your architect (OR DESIGNER!) as your proxy. Just know that your selection of a contractor is the first of many you will make. Tell us: What have you learned from your latest remodel? Great looking and functional kitchen eating banquette areas. Below is a guest post on relatively simple, low cost things you can do to transform the look and feel of your kitchen quickly. Tired of looking at your drab kitchen but don’t have the time or money to invest in a complete makeover? Don’t fret. With a little imagination and some elbow grease you can spruce up your culinary digs in a weekend. The best thing about these projects is that you can do them one at a time and not have to deal with the mess and hassle of a complete remodel. So what are you waiting for? Dig out your paint brush and screw driver (and maybe a hammer) and put on your weekend warrior face. Here are a few projects that won’t break the bank and will leave you beaming with a feeling of accomplishment. A new light fixture can literally brighten up your kitchen. 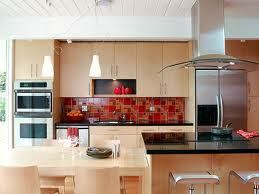 Pick a fixture that appeals to your kitchen décor but also provides adequate light to work under. Wish you had a number of lights overhead? Choose from a variety of track lighting options that replace your old fixture yet don’t require additional wiring or holes in your ceiling. They look great and instantly update an older kitchen. Sometimes it’s the small details that make all the difference. Replacing outdated cabinet hardware with a modern design won’t go unnoticed. This is one of the easiest updates you can do yourself. If you don’t want to drill new holes in your cabinets and drawers, simply take one of your current hardware pulls with you to the store and match it up against the selection there. Brighten up your kitchen with fresh coat of paint on the walls and/or ceiling. If you’re feeling bold go for a bright color. A splash of color on the walls will transform the whole feel of the room. Remember, ceilings don’t have to be white (or one of the millions of off-white). And if that’s not enough, consider painting the cabinets as well (or instead). It’s remarkable what a fresh coat of paint can accomplish and with some sandpaper and elbow grease—and paint, naturally—you can turn dreary or boring into a high-class fashion statement. Depending on how much kitchen floor space you have, this project may be a little more involved, but it can easily be worth the addition effort. The floor can often go unnoticed and many kitchen floors are notorious for being drab and outdated. Rip out the old and put down something new and fresh. Consider hardwoods, stone, and eco-friendly bamboo. 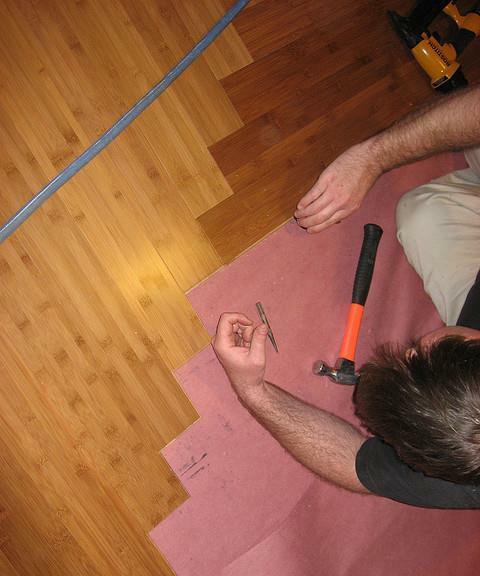 If you already have a hardwood floor, then it’s even easier! Give it a nice sanding and a new finish. 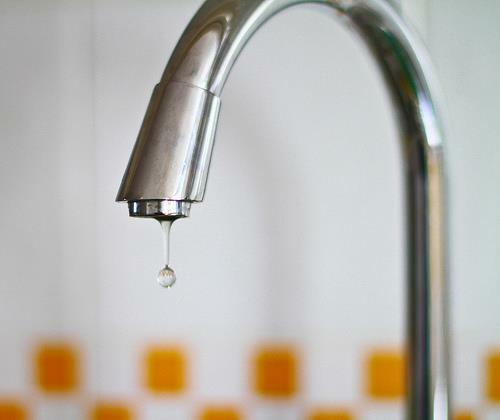 It may be time to replace the workhorse of your kitchen, the faucet. 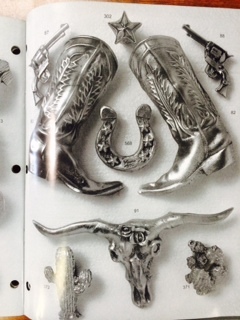 An updated faucet will not only be more versatile than your old one but it will make a fashion statement as well. These days the selection is simply astonishing with everything from hands-free operation to faucets designed to accommodate the largest of pots. About the author: Jonathon Ensor stays on top of the latest home design trends as a writer for Empire Today. He loves to get unique furniture and decorations from thrift stores and garage sales. Here is an interesting article about the top kitchen design trends coming in 2014. It caught my eye because S Interior Design is currently designing a kitchen for one of their clients and we are using black quartz counter tops, a deep red glass back splash tile, and lighter wood toned cabinetry. We are on-trend and didn’t even know it! Black kitchen counters: Homeowners who want to add sophistication to their kitchen can achieve this look by specifying black granite and quartz. Expect to see black-countered kitchens paired with lighter colors for contrast. Houzz has released the results of its first “Kitchen Trends Study,” which is based on responses from more than 7,500 homeowners who are currently undergoing a renovation or are planning a remodel. Some of the main trends gleaned from the survey are that the open-concept kitchen is still widely popular, granite and quartz are the materials of choice when it comes to countertops, mixing appliance materials is considered, and conservative colors schemes dominate the market. The study also found that 49 percent of the responders believe in completely gutting the existing kitchen, while 42 percent prefer to update their existing space. In terms of finishes and colors, 65 percent of responders are incorporating stainless steel appliances into their kitchen design, while many are also combining stainless with white or color appliances or integrating appliances into the cabinetry. Soft and neutral tones were most popular with responders, and topping the list of must-have appliances are a chef’s stove, double ovens and induction cook tops. Half of the responders chose stone as the preferred material for counter tops, with quartz coming in as a close second with 36 percent. Top back splash choices include tile and glass, and top flooring choices include hardwood and tile. The study also found that homeowners under the age of 45 prefer a contemporary design in their kitchens, while the traditional look is most popular with those over the age of 45. Seventy-nine percent of the responders said they chose to or are choosing to renovate their kitchens to improve the look and feel of the space, and 59 percent want to improve the kitchen’s function. Other motivators include appliance upgrades, improved storage and increasing the home’s value. Only half of the responders were concerned with creating an eco-friendly kitchen in terms of appliance and material selection. Out of the 7,812 homeowners who were surveyed, 32 percent have already begun construction on their kitchens, and 68 percent have yet to start, although it seems likely they know where they want to go once they get there.